Dolina Chochołowska, the "Valley of Chochołów", after the name of the village located further north downstream, is undoubtly the finest valley to cycle in the whole Polish Tatras, with almost 8km of cycleable part. At Siwa Polana, 1km south-west from the main road, is located the entrance of the National park and the car park. The cost for the entrance is (unfortunately) 10zl, which makes around 3E. This money is used for the trails maintainance in the national park. Before 7am there is no one in the hut of the toll. If you cycle but plan to get on the spot by car, I recommend also not to parc at this place but somewhere further north, possibly near some houses, for example in the direction of the village of Koscielisko. From the beginning to Polana Huciska, the trail is an asphalted road. It is also possible to skate it with roller blades on all this section ! Later, a wide land-rover-type trail cobbled with granit stones. It climbs steadily, with a steep portion located just before Leśniczówka Chochołowska. Some of the less sporty cyclers may resign at this point. From Polana Trzydniowianska to Polana Chochołowska, the trail goes steadily again. You cross a little gorge into which the river made its way, and then you arrive in Polana Chochołowska, a mountain pasture with many wooden barns. These barns are not used anymore, and it is also forbidden to enter them, they are classified as national cultural monuments. Some of them are more than 200 years old ! They are a precious testimony of the old mountain lifestyle in the Tatras. In this meadow is located also a little wooden church, which used to belong to this "village" (in the past time, it used to be a "village" during all working summer season); this chapel is still in activity and many people make pilgrimages to it. At the end of the meadow (Polana) is discretely located the mountain refuge of this valley, at the limit of the forest. "Schronisko Górskie PTTK na Polanie Chochołowskiej" can accomodate around a hundred people for a modic price. there is a local to store bikes. There might be a lack of space during highly touristic moments of the year (nice or long week ends, summer holidays), so if you can, bring a duvet and possibly a mattress if you plan to sleep. There is also the possibility to order just a meal, a tea, a cake, or even just a pint. You can either try to reach first Zakopane (from the city of Cracow, airport), or avoid it (frequent traffic jams during week ends and holidays). 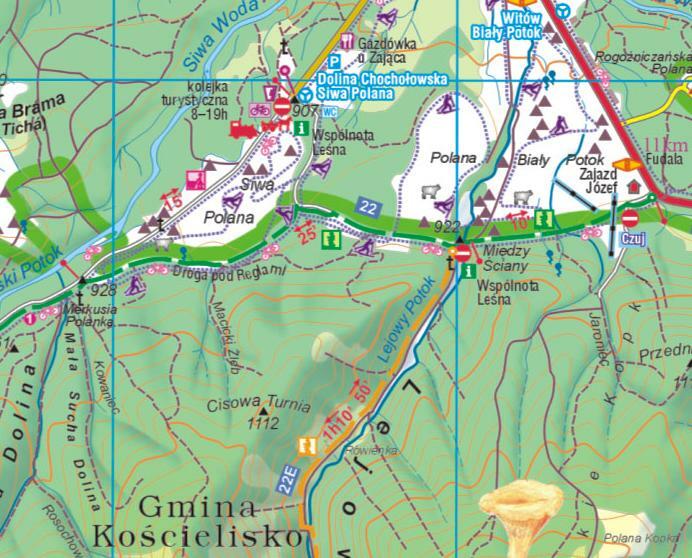 In this case, from Nowy Tag, take the direction of Czarny Dunajec and then Chocholow. In the summer, there will be a lot of tourists on the trail, in this case start early in the morning.